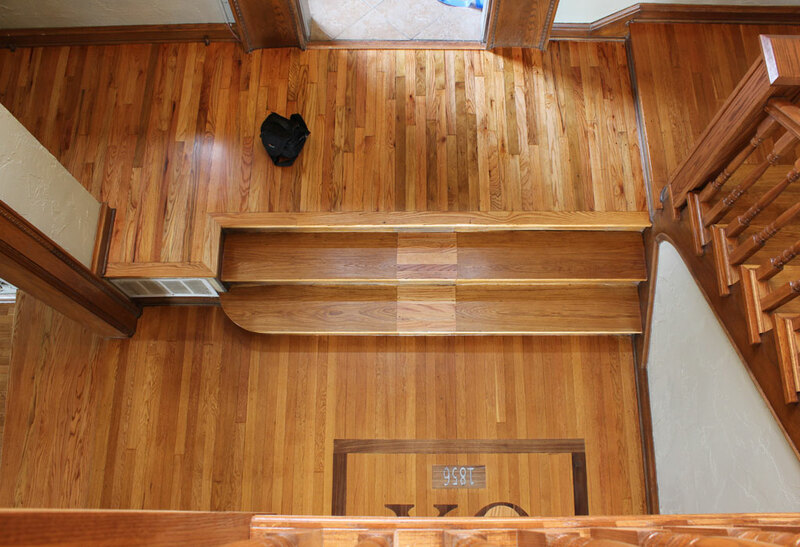 Providing commercial hardwood floor refinishing throughout the Kansas City area. Our commercial work features the same quality, professionalism and organization as our smaller residential jobs, just on a much larger scale of course! We are fully insured with General Liability and Workers Compensation insurance, both important insurances when doing commercial work. If instructed, our team will move any furniture and appliances off hardwood flooring. We hang plastic to block off non-service area. First cut of sanding (24 or 36 grit sandpaper) using our dust-free equipment for minimal debris. If spaces between boards are smaller than the width of a quarter (coin), then a coat of filler will be trowel filled into the cracks/nail holes/gaps in existing hardwood. If larger than the width of a quarter (coin), our recommendation is to either leave it or strip filling the area by cutting actual pieces of flooring and filling in the gaps manually. A consultation will determine which method would work best for the circumstance. Final cut of sanding (50 & 80 grit sandpaper)/buffing (120 grit sandpaper) using our dust-free equipment for minimal debris. Stain floors with agreed upon stain color, seal over the stain to protect the color. Finally, apply 2 coats of agreed upon finish to complete the process. Using professional moving straps, move furniture and appliances back onto hardwood floor making sure no scratches or dents will mess up your brand new floor! From the very start, I had nothing but great things to say about Travis and his team at RippnFinish! A true class act! And the floors……. WOW was all I could say!!! Travis came to my home and talked to me about all my colors in the house, and suggested I think about a white floor. After they were all done, I could totally understand the vision he had for the way they would look. The only thing I could have asked for different, was that I made the call sooner to have the RippnFinish redo my floors. Thanks to Travis and his team…..